Telltale's co-founder states that for The Walking Dead Season Two, they will "evolve it so that it's not a clone" of Season One. Speaking to OXM in its latest issue regarding The Walking Dead Season Two, Telltale Games co-founder Kevin Bruner says that "The goal is to try to make it better than Season One - and to evolve it so that it's not a clone." Bruner adds, "we can take everything we learned from the first season - and everything we've learned from Fables so far - and hopefully it'll be better than both Season One and Fables, and be the most evolved thing that we do. But we'll be ambitious with it - I don't think that 'Don't screw it up; just feed them more' is our style." This comes after the surprise success of the studio's 2012 release of The Walking Dead adventure game where choices and narrative mattered more than the actual gameplay. However, given that Telltale is using the same gameplay mechanics from The Walking Dead Season One and Fables: A Wolf Among Us, it's understandable that some people might assume that developer will tread familiar ground once more. 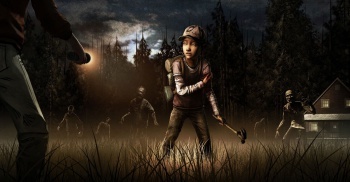 For those who've played the first episode of Season Two, has Telltale succeeded? Judging from our review of "All That Remains," it seems Telltale is on the right track. The second season's first episode titled, All That Remains, is now out for the PC, PS3, Xbox 360 and iOS devices for $4.99, or you can buy the entire season at a discounted price of just $20.